The nervous system is richly endowed with large transmembrane proteins that mediate ion transport, including gated ion channels as well as energy-consuming pumps and transporters. Transport proteins undergo N-linked glycosylation which can affect expression, location, stability, and function. The N-linked glycans of ion channels are large, contributing between 5 and 50 % of their molecular weight. Many contain a high density of negatively charged sialic acid residues which modulate voltage-dependent gating of ion channels. Changes in the size and chemical composition of glycans are responsible for developmental and cell-specific variability in the biophysical and functional properties of many ion channels. Glycolipids, principally gangliosides, exert considerable influence on some forms of ion transport, either through direct association with ion transport proteins or indirectly through association with proteins that activate transport through appropriate signaling. Examples of both pumps and ion channels have been revealed which depend on ganglioside regulation. While some of these processes are localized in the plasma membrane, ganglioside-regulated ion transport can also occur at various loci within the cell including the nucleus. 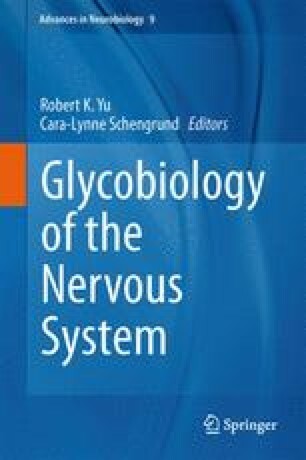 This chapter will describe ion channel and ion pump structures with a focus on the functional effects of glycosylation on ion channel availability and function, and effects of alterations in glycosylation on nervous system function. It will also summarize highlights of the research on glycolipid/ganglioside-mediated regulation of ion transport.